Running a small business usually means one or two people are responsible for almost everything. Despite not having to manage many people and multiple locations, there are some tools used by large corporations that should be used by small companies, even if they aren’t obvious. Most small business owners don’t create organizational charts. “What’s the point?” they figure. 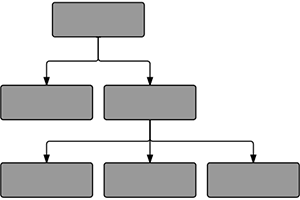 “The organization is me.” Yet even as a solopreneur, the organizational chart is a useful tool. By creating one, you are defining every function that needs to be performed by your company. Even if the name in all the boxes on the chart is the same, or split between only a few people, it helps ensure that you are not missing any crucial responsibilities. It also sets you up for growth, in that it becomes easier to share responsibilities as the company grows, simply by bringing in new people for specific positions that you have already structured. In a company like McDonalds, Wal-Mart or Apple, the day to day work is done at many locations. The strategic work of building the business, however, is done at the corporate office. This is where growth strategies, productivity initiatives, and new product development take place. No matter how small your business, you need a space to do that same work. If you have the room, set up a desk where the strategic work takes place. If you don’t have the room to create a separate space, use a additional “inbox” to differentiate the work. Do your strategic work at your local coffee shop instead of where you do the rest of your work. By having a physical separation, you create a distinction between working in your business and working on your business. That distinction can help your mindset adapt to the different responsibilities of each. “Why would I need a training manual?” a solopreneur asks. “I’m the only one doing the work and I know what I’m doing.” The better you know your business, the greater the need for a training manual is. By creating a step-by-step manual that explains what you do and how you do it, it clarifies each step. When you do a job for an extended period of time, you become so used to doing it that steps blur together. As those steps blur, people tend to create shortcuts. As it all blurs together, and more shortcuts are taken, the more likely it becomes for the quality of the work to fall. Also, by keeping the steps clkearer, it becomes easier to locate and fix problems should they arise. These tools help to keep your business running smoothly, whether you have hundreds of employees or it’s just you.